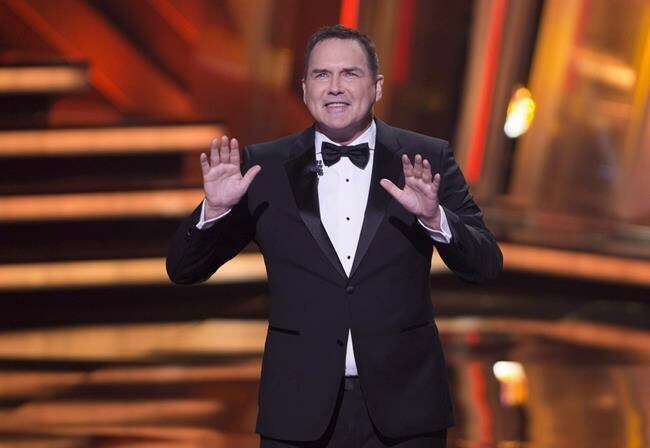 TORONTO — There's a moment on Norm Macdonald's new talk show where the Canadian comic muses on what is and is not appropriate to say: "I always felt that some epithets were less abrasive than others, you know," he tells his guest, a lively Drew Barrymore. "It's like navigating a one-inch tightrope on an ice skate," the seasoned actress concurs. "That's what talking feels like today in this world." It's an oddly prescient exchange that appears in the second episode of the new talk show, "Norm Macdonald Has A Show," given the firestorm Macdonald has ignited in recent days. While promoting the Netflix series, which premieres Friday, he's had to issue an apology for several offensive remarks, and then an apology for that apology after further digging himself into a quagmire. The standup veteran is known for speaking his mind, but the social conventions, celebrity culture and news industry have changed vastly since he skewered O.J. Simpson and Michael Jackson as the Weekend Update anchor on "Saturday Night Live" in the late '90s, note several media observers. Macdonald's multiple blunders are a good reminder that celebrities are often better off just keeping their mouth shut when asked to comment on hot-button issues, says public relations guru Natasha Koifman, of the Toronto-based NKPR. "Listen, I wish they were a little more nervous," Koifman says when asked how these blunders continually plague seemingly smart, veteran performers. "They have to be super-careful and I think that sometimes they forget that what they say actually matters." Macdonald has since said he was "confused" when he told The Hollywood Reporter in an interview published Tuesday that he was "happy the #MeToo movement has slowed down a bit" and that his famous pals Roseanne and Louis C.K. lost "everything in a day" while "the victims didn't have to go through" what they did. The next day, he told "The Howard Stern Show" that he was misinterpreted and that he saw value in the #MeToo movement — however while trying to clarify his comments on sexual misconduct victims, Macdonald made an insulting reference to people with Down syndrome. He appeared on "The View" on Thursday to apologize for that odd comment, saying "I realized at that moment I'd done something unforgivable." Macdonald's former talent agent Louise Parent says she finds it hard to believe he meant any offence, nevertheless admitting she hasn't spoken to Macdonald in years or read all the coverage about what is increasingly becoming his mea culpa tour. "I know Norm, he's an old friend and I know how he speaks," says Parent, who represented Macdonald in the late '80s for acting jobs. "He absolutely is not somebody that would disregard the victims at all." She said it's a challenge for celebrities to speak eloquently on delicate topics they're often asked to address with little notice. "You get put on the spot very quickly and you say something that maybe isn't reported correctly and then you get the backlash," says Parent, noting the 24-hour news cycle makes it especially hard to stay on top of developments. "There's coaches and managers and publicists that are (telling them) 'Here's what happened in the last hour,' or, 'Here's what happened in the last 10 minutes.' ... You're supposed to be up-to-date all the time." Then there's the fact that, as Parent puts it: "It's Norm, that's how he talks." Still, it's no less bizarre to hear Macdonald ramble down an array of tangents during a phone interview with The Canadian Press that took place before his #MeToo comments made headlines, and the backlash that erupted. He discussed his dream to secure a residency at a Las Vegas casino, his side gig as the co-creator of a dating app called Loko, and his admiration for Toronto criminal defence lawyer Marie Henein, best known for successfully defending disgraced CBC Radio star Jian Ghomeshi against sexual assault charges. "Oh my God, she's so beautiful. She's the most beautiful woman I've ever seen in my life," Macdonald exclaimed in an odd segue from noting that Hart Pomerantz, the former comedy partner of "SNL" boss Lorne Michaels, is now a lawyer. When asked why that's his lasting memory of the 2016 trial, he adds: "because she's so smart and so mysterious." "I'm sure people must hate her guts for defending that guy," he continues. "They should understand the rule of law, (defence lawyers) are not betraying all of humanity." Then there's his desire to return to "SNL" so he can do an impression of controversial professor and free-speech advocate Jordan Peterson. Macdonald expressed admiration for the firebrand on Twitter back in Feb. 14, with the message from his verified account stating: "You changed my life years ago and I want to say thank you." Whether he gets the chance to actually do his impression depends on getting the greenlight from Michaels. "I have to wait until he knows who Jordan Peterson is," he says. "Jordan Peterson is just sort of on the radar here. I mean, he's huge, but he's sort of a secret person." Koifman says it's easy for some celebrities to forget their opinions might differ from most of the mainstream public, and that's something she's constantly trying to address in her work. "You can have an opinion but you do have to pay attention to what the public is saying and what the public is feeling about a specific topic," she says. "The reality is celebrities are often surrounded by a lot of 'yes people' — that's part of the problem. That doesn't give them a very good perception of what the public perception is of things." Ela Veresiu, an assistant professor of marketing at York University's Schulich School of Business, says the old mantra that any publicity is good publicity is dead. "I feel like there is an obsession among celebrities ... with staying relevant," says Veresiu. "And then the narrative usually unfolds in a very similar fashion — they say something very controversial, either through their own social media channels or in an interview, it gets picked up, there's a huge backlash of appearances and shows or performances getting cancelled, and then the celebrity back-pedals and eventually apologizes. "But the damage is already done." Koifman tends to tell her clients to avoid saying anything. "You don't always have to have a public opinion." Note to readers: This is a corrected story. A previous version misspelled Natasha Koifman's first name.